Our understanding of the world around us has grown by leaps and bounds since the invention of the computer. 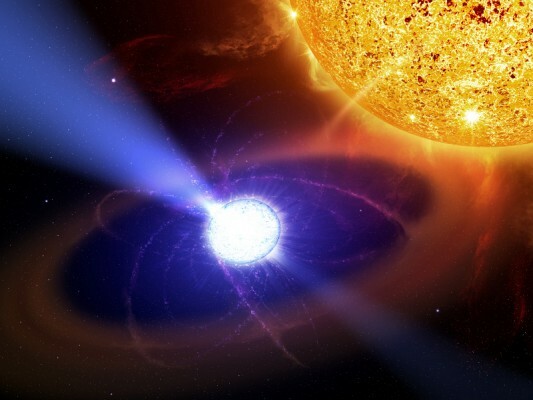 The simulation of complex systems in particular involves crunching a ton of numbers, a task computers excel at. Unfortunately, the very best number crunchers happen to be extremely expensive, both to buy and to maintain. Through a system known as distributed computing large, complex tasks can be completed without the hassle of managing a supercomputer. In distributed computing, a central server offloads small tasks to the computers connected to its network. Each computer completes its task and sends the results back to the server. By utilizing the spare CPU cycles of tens of thousands of volunteer computers, a project like Folding@Home can complete vital research without needing to buy pricey supercomputers. Distributed computing networks exist for a vast array of scientific pursuits, including disease research, the factorization of large integers, and even the search for extraterrestrial life. Major distributed computing platforms have been available for the desktop computer for more than a decade, and a Folding@Home app can even be installed on the PS3, but until now the mobile market has remained largely untouched. The Berkeley Open Infrastructure for Network Computing (BOINC) has changed that with the recent release of their Android app. Upon first opening BOINC’s app you’ll be prompted to select a distributed computing project to contribute to. A brief overview of each project’s goals can be found on BOINC’s website or by selecting a project in the app. After selecting a project you’ll need to create an account to track your computing progress. Once you’ve created an account, BOINC is ready to do its work. You’re probably thinking that an app of this nature would quickly drain your phone’s battery, and you’d be right if the BOINC app ran continuously. Thankfully, it isn’t configured to run continuously. By default, it only runs when your phone is connected to power, and even then only when the battery is charged to at least 90%. These settings (and others) can be fine tuned in the preferences menu. I highly recommend changing the max used storage space option to something much lower, as the default setting is absurdly high. The computing power of a current generation smartphone might not compare to that of even a meager desktop computer, but combined with thousands of other phones that power becomes much more substantial. Every little bit helps. 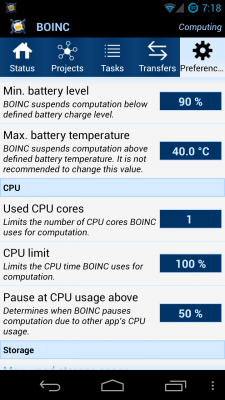 BOINC is available for Android and can be found on the Play Store. Clients for Windows, Mac, and Linux can be found on the BOINC website.